Platelet membrane glycoprotein Ib (GPIba) is comprised of an a and b subunit linked by disulfide bonds. 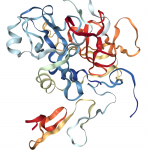 GPIba (also known as CD42b) is a 135 kDa membrane protein subunit that binds a variety of adhesive and procoagulant ligands, including von Willebrand factor. Cleavage of GPIba by the “sheddase” ADAM17 releases the ectodomain glycocalicin into plasma. ADAM17 cleaves GPIba at Gly464-Val465. R.W. Colman. Major platelet Glycoproteins: Platelet Glycoprotein Ib-IX-V (2006). Hemostasis and Thrombosis: Basic Principles and Clinical Practice. Philadelphia, PA: Lippincott Williams & Wilkins. R. Li, J. Emsley. The Organizing Principle of Platelet Glycoprotein Ib-IX-V Complex. (2013). J Thromb Haemost. 11(4): 605–614.